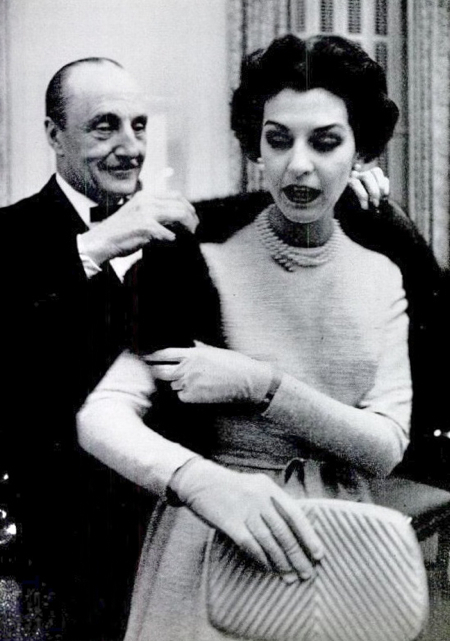 1956 | Décolleté scamosciate disegnate da André Perugia, parigino di origini italiane, costruite con un binario sulla suola che consentiva la sostituzione del tacco. Il prezzo originario era di $50, comprensivo di tre paia di tacchi (cfr. foto sotto). Il meraviglioso tacco sottilissimo in acciaio (a sinistra, brevettato nel 1951) faceva parte di un vasto campionario che poteva essere ordinato a parte [e successivamente copiato senza vergogna]. 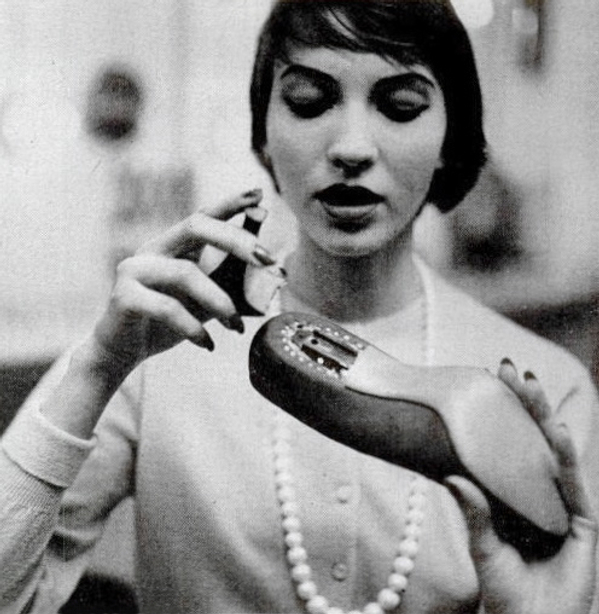 1956 | Suede cocktail pump designed by André Perugia, Parisienne of Italian origin, and made with a metal track on the bottom along which heels slide on and off. 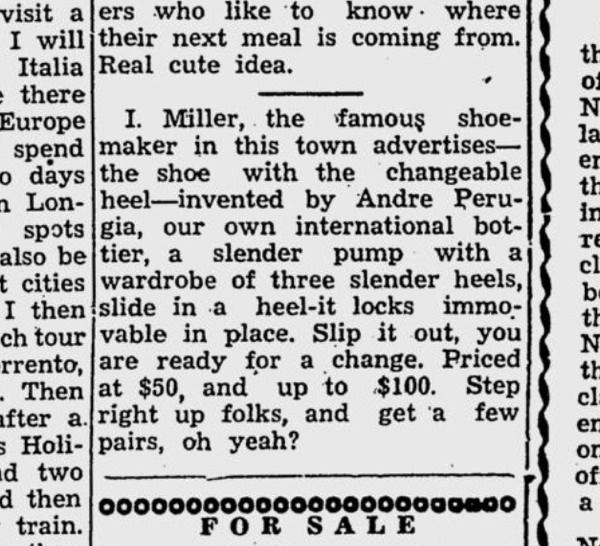 Price was $50 for a package of pumps plus three set of heels [see below]. 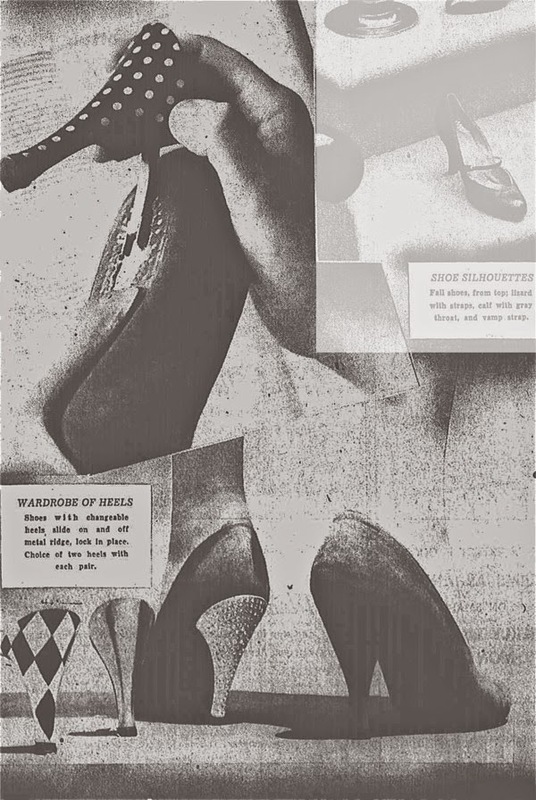 The gorgeous slender steel heel on the left (Patented in 1951) was part of a wardrobe of heels which could be ordered separately [and eventually shamelessly copied]. Il binario di 32 mm consentiva il posizionamento del tacco. Tra le varie decorazioni disponibili: quadri, pois, strass, semi preziosi incastonati, pelle o velluto rossi, capretto oro o argento. 1¼-inch track along which the heel slides into position. 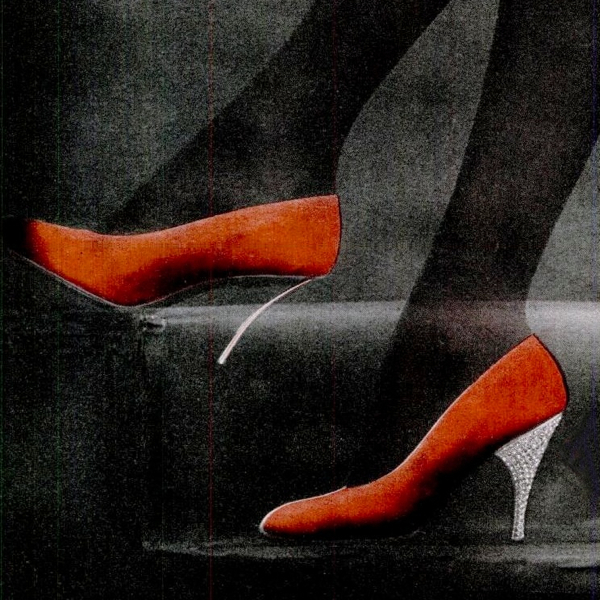 Among the heels design: domino, rhinestones, jet-encrusted, red leather, red suede, gold kid, silver kid. 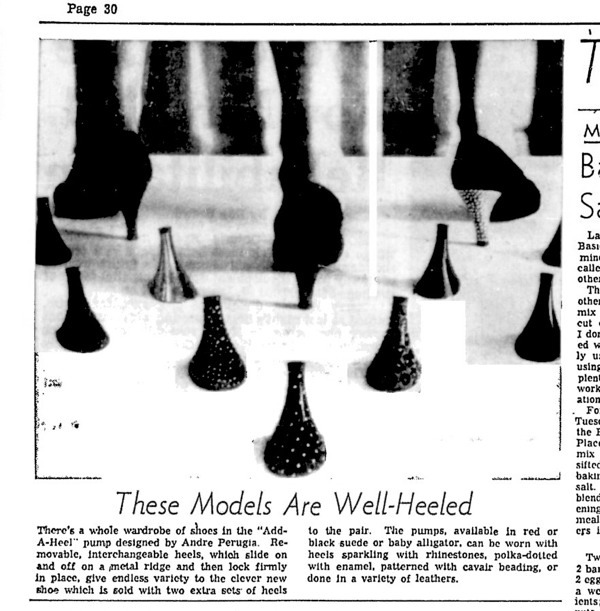 FOR TRIPLE CITIES WOMEN who love shoes — a new device. 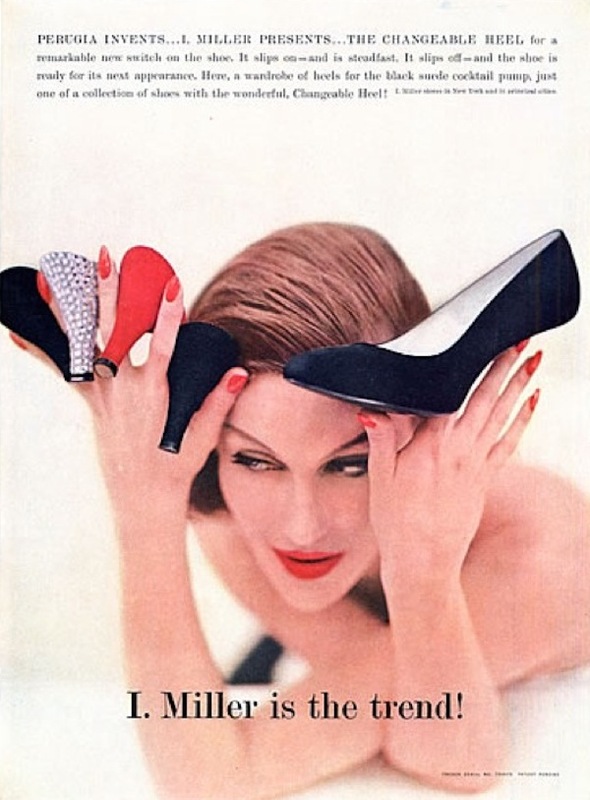 Andre Perugia, Parisian shoe designer, has concocted an interchangeable heel for I. Miller. 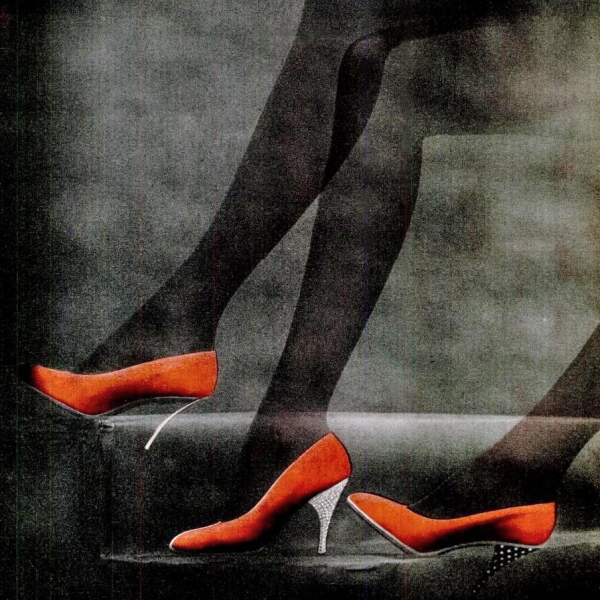 Black and red suede shoes come in packages with matching heels plus two auxiliary heels. You can have your choice of a gold-colored heel, dots, a harlequin pattern, or dressy caviar beading. 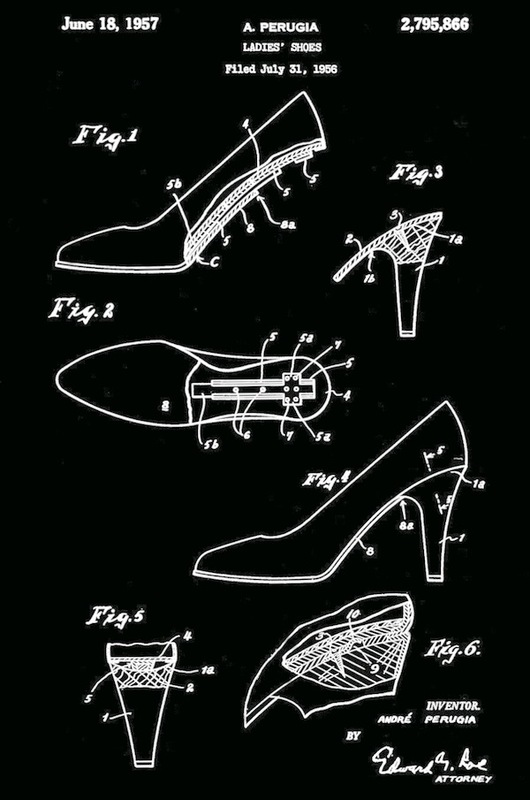 A bar which curves along the shank of the shoe, undernear the outsole, is the sliding device which makes the quick change possible. 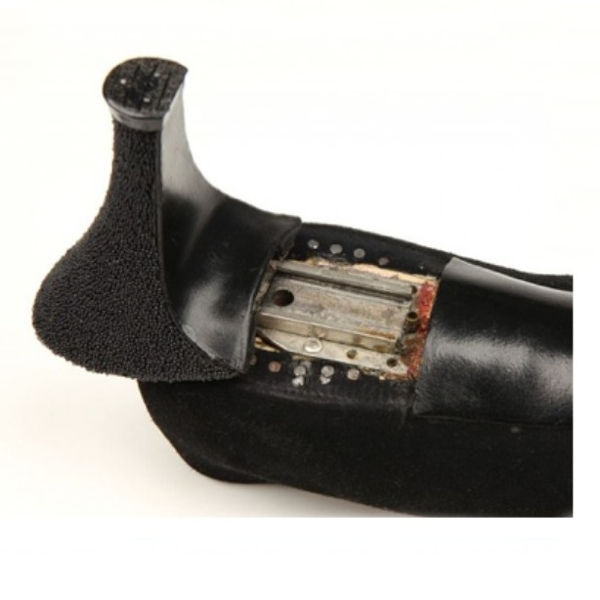 Heel with a lock is inserted into the rail.